Cranberry sauce is a staple at Thanksgiving, and my vegetarian feasts are no different! Check out my take on this traditional meal with a spicy kick below. I have always been a vegetarian and I raised my children this way as well. When I moved to the United States, I wondered how I could celebrate Thanksgiving with my fellow Americans. Being vegetarian meant that a turkey dinner was off the table. But I loved that we as a country could take a day to appreciate all the things we are thankful for and strove to establish a Thanksgiving tradition, Prabhakar-style. Since the evening is always booked for this get together, Prabhakar family Thanksgiving lunch emerged. Every year, my daughters, my husband, and I make a feast worthy of double the size of our family. We dress up in fancy clothes, take out the fine China, and catch up with each other. Then, we clean up, change into sweats, and go hang out with our extended family! It is the perfect set up. As my girls got older and our family started to grow, we became more and more inventive with our meals, learning from each other in the kitchen. But there are some things that do appear consistently on the menu every year. Every year, no matter what, we try to incorporate some Thanksgiving staples, such as root vegetables and cranberry sauce. Cranberry sauce always makes an entry each year, either as a side to the entree or as part of the dessert. This year, I made a variation of the traditional sweet and sour cranberry sauce: a spicy cranberry sauce. I made this sauce with cranberries (obviously), cumin (like I do), turmeric, red chili and jaggery. You can find jaggery at Whole Foods, Amazon or your local Indian store (here’s looking at you, Patel Foods). However, an easy substitute is honey or agave. Keep this simple! It’ll work for Thanksgiving, as well as your sandwich full of leftovers the next day! On Thanksgiving day this year, we plan to create a large cheese board paired with the spicy cranberry chutney and honey roasted carrots. Over the next few weeks, we’ll share more of our holiday recipes that connect the East and West. 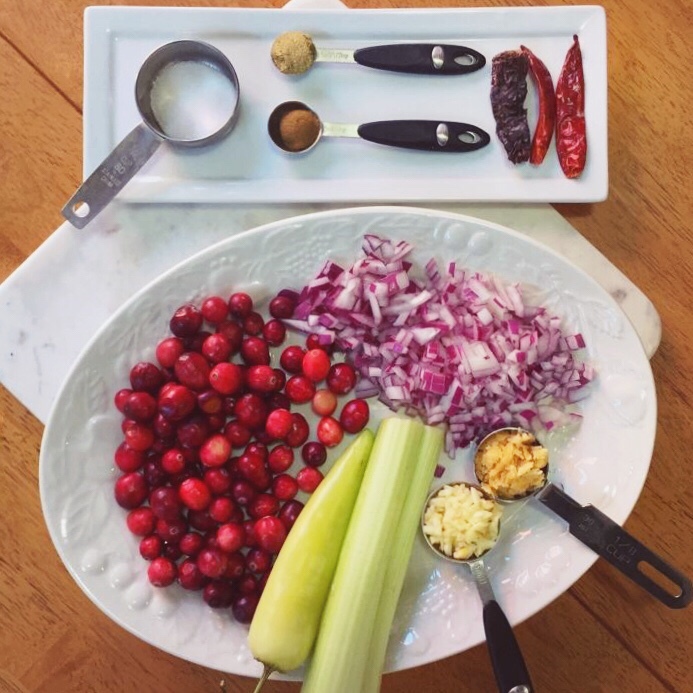 For now, try out this spicy cranberry sauce and add it to the mix tomorrow for a new yet familiar dish! 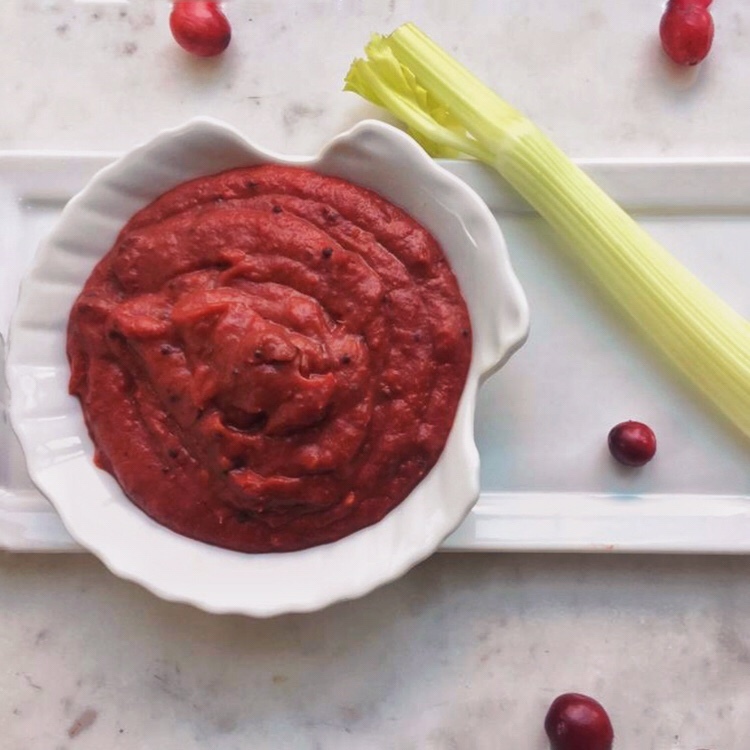 A spicy twist on the traditional cranberry sauce for Thanksgiving or the Holidays. Turn the flame to low-medium. Remove the lid. The cranberries will be soft and you should be able to mash them with your spoon. Now, add salt, turmeric, cumin powder, coriander powder and jaggery. Saute for a minute or two and cook the mixture covered for five more minutes until the raw smell of the spices is gone and cranberries mixture is well combined and has become soft and smooth. Turn the stove off and let the mixture cool. Transfer the mixture to a mixer jar and pulse it into smooth paste. Heat a tablespoon of oil in the saucepan and add mustard seeds. When the seeds begin to splutter, add the ground cranberry mixture. Scrape the sides of the jar and transfer it to the saucepan. Cook in low flame until the mixture thickens to chutney consistency. This process should take a couple of minutes. It serves as a nice spread for your rolls as well!